As promised, here is the update on our path to enlightenment. First of all, I just didn't have a thing to wear. Not an all-cotton organic tunic in the house. Sure I have some yoga pants but nothing flowy and otherworthly looking enough to wear with them. And Dave? Well, look. I can't even get him to carry an urban man-bag so forget the whole loosey/flowy metaphysical enlightenment wear. It's not going to happen - even though I did happen to take this picture of him looking all thoughtful and retrospective for his new age CD brochure. Author's note: I secretly suspect that someone on Facebook has an old pic of him wearing an all cotton button down washed out shirt with embroidery on the collar and cuffs, just sayin'. Frye boots. Moccasins. You remember. So. Anyway the point is, we didn't go to the Buddhist seminar/meditation on "Fear," most likely because deep down we were too afraid to go, and so after dinner I decided to meditate to OK Computer. Next thing you know Dave was pulling out his musical drugs of choice and we both found ourselves in our dreamy/progressive rock/Jim Morrison induced trances where I acknowledged thoughts and then sent them away and found inner peace and then went to bed. This morning the evidence of our mindful meditation was strewn on the coffee table. 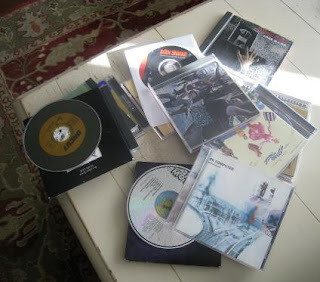 A group of well-loved cds lit by a ray of white light shining down from above.